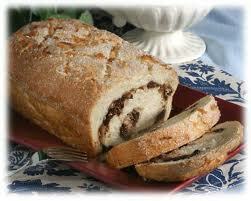 This yummy swirl loaf is loaded with chocolate chips, pecans, and coconut flakes. Easy for kids to make. Roll dough into a 7 X 11 inch rectangle. Sprinkle with sugar, coconut, chocolate chips and pecans. Sprinkle the loaf with the additional ingredients. Place the loaf on a well greased loaf pan and cover with plastic wrap until double in size. Then bake at 180C (350F) degrees for about 35 minutes or until golden brown.